We are your source for A.O. Smith water heater and boiler parts, as well as new boiler, water heater and solar systems. Contact us if you need assistance finding what you are looking for. If you know the part number you need, it can be found in our AO Smith parts number catalog. If you don't know the part number, you can search by AO Smith model number and find the part that you need. Beginning Another Half Century of Industry Leadership . . .
First to introduce high-efficiency residential water heaters - A.O. Smith's famous Conservationist® line. Presently in commercial water heaters, they offer far and away the industry's widest selection. Everything from extra-high 99% efficient Cyclone XHE® to highly efficient Powered Burner water heaters to A.O. Smith's superbly engineered Burkay® Legend 2000® boilers. A.O. Smith classifies their commercial products as "Standard Commercial" and "Specialty Commercial". With over 500 commercial models to choose from, no other source makes it so easy to find just the right unit, the right efficiency, and the right capacity to meet every application. At today's A.O. Smith, they are putting teamwork, technology and over 50 years of industry leadership into finding solutions that are right for the times. More products. Better products. Better ways to serve you. That's the A.O. Smith One Source Difference. A.O. Smith Master-Fit® commercial gas water heaters have always provided maximum installation flexibility for both new construction and replacement applications. Now, Master-Fit offers The Eliminator™, for automatic self-cleaning protection against build-up of lime and other sediments. As deposits of lime and other sediments accumulate inside the tank, they form a barrier between the burner and the water, and concentrate heat around the critical weld areas. The result is reduced energy-efficiency, higher operating costs, and a greater risk of premature tank leaks. The Eliminator™ directs incoming cold water under pressure to sweep the bottom of the tank, to keep sediment moving so it doesn't accumulate. With The Eliminator™, every Master-Fit water heater can be expected to maintain its rated efficiency longer, and deliver year after year of reliable service. Nothing protects like it, and nobody offers it but A.O. Smith. PermaGlas® Ultra Coat™ is an exclusive "slush coat" process that heat-bonds glass to each tank's inner surface after all connections and seams have been welded. Because it's a slush coat process instead of a spray-on coating, PermaGlas® Ultra Coat™ covers and protects better. And because A.O. Smith PermaGlas® Ultra Coat™ is applied after the tank is welded, there is no chance of "weld burn" that can burn away normal glass lining and expose bare steel to water. The inside of the Cyclone XHE® heat exchanger is protected against corrosive flue gas condensate by PermaGlas® Ultra Coat™. 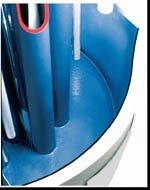 PermaGlas® Ultra Coat™ provides superior protection for the tank's top, bottom, outer shell, and all weld seams.